Regarding orders with labels and tardy passes, the default colors will be Yellow for visitor labels and White for tardy rolls if no other colors are selected. Ident-A-Kid *Touchscreen Computer Package - Visitor and Student Tracking All equipment you need for IAK VM, ready to run out of the box! •Please allow up to 2 weeks for fulfillment of this product. *Software sold separately. *Photo is for general reference, see description for list of included items. All equipment you need for IAK VM, ready to run out of the box! •Please allow up to 2 weeks for fulfillment of this product. *Photo is for general reference, see description for list of included items. Please select the color of your labels. Please select the color of tardy passes. A one-time price of $1,660.00 will be added to your order. *A handling fee of $20.00 per package will be added to your shipping total at checkout. This package is the best way to get started with Ident-A-Kid VM. Including all the equipment you need for Visitor and Student trakcing, plus savings to match. Everything we include works perfectly together and all the software comes pre-loaded (software license sold separately). 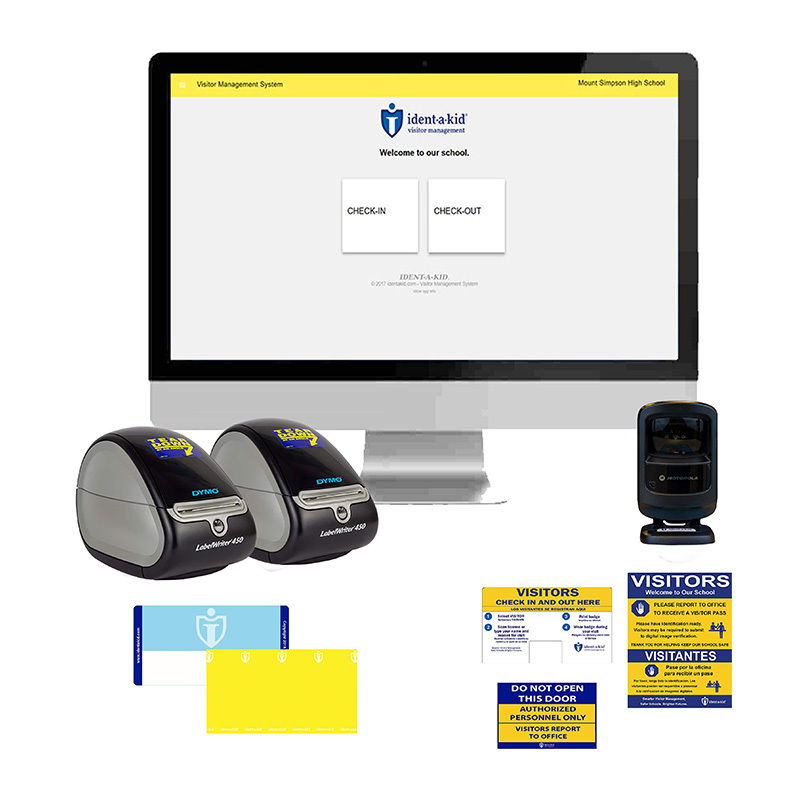 Touchscreen Compatible Desktop with a 21.5 inch display, Windows 10 Home Edition, Optical Scanner, powered USB hub with 7 ports, 2 Dymo Single Printers, 7 Rolls of Visitor Labels, 3 Rolls of Tardy Passes and Deluxe Sign Pack with an option to add on a webcam for $35. *This computer comes with Windows Home Edition. If you would like another version of Windows (Pro or Educational), please send the product key with your order. We will apply your licensed Windows Edition before installing the software. To view a comparison chart between software versions, click here. *All payments must be prepaid. Prepayment is accepted by credit card, sending a purchase order, or when a check is received by Ident-A-Kid. Larger signs can be customized with school name, colors and artwork . Great for directing parents and students to the correct location at school. Dry Erase Board Panels come with board cleaner and markers for free. *After ordering a custom tardy sign, please email customorders@identakid.com with artwork and wording for the sign to be designed. Once a design is made, you'll receive a proof of the sign for approval. When the sign is approved, the tardy sign will be shipped. Please allow up to 2 weeks for fulfillment of these products. These cards allow the school to put a personal and professional touch to their on-campus identification needs. After ordering custom Staff RFID Badges, please email customorders@identakid.com with artwork for the badges to be designed. *Includes badge clips or lanyards. Please specify which one with purchase.